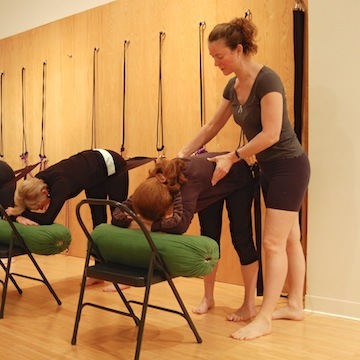 Sara Azarius Eichmiller is Western Pennsylvania’s most experienced teacher of Iyengar Yoga. She holds an Int Jr 3 Iyengar teaching certificate and is a certified yoga therapist with the International Association of Yoga Therapists. Sara took her first yoga classes as a 10 year old and has been teaching yoga full-time since 1995. She founded and developed Pittsburgh’s only Iyengar Yoga studio to cultivate a community of teachers and students dedicated to the Iyengar method. Sara served three years as President of the Yoga Training Association of Pittsburgh, was the Yoga Coordinator at the River’s Club fitness facility, then founded and directed Shadyside Yoga on Ellsworth Avenue. In 2005 she opened Yoga On Centre which she has transformed into the non-profit Iyengar Yoga Institute of Pittsburgh. She has instructed many of Pittsburgh’s yoga teachers in her teacher education programs and ongoing mentorship programs since 1999. 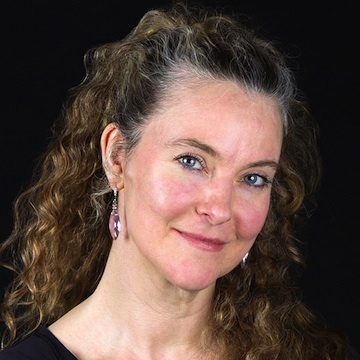 Sara’s teaching is a direct approach to yoga asana, pranayama, philosophy and meditation. She uses the practical arts of yoga to make living on Mother Earth increasingly more joyful for herself. Sara considers herself blessed to be of service through yoga and to be able to help others with this transformative art. Sara graduated in 1990 from Penn State University with a degree in print journalism. She worked for five years in Pennsylvania as a newspaper photographer before living in North Carolina and Texas and taking up earnest training in yoga. She has been sharing yoga with her hometown, Pittsburgh, since 1996. “My wife studied Iyengar in two other cities (Atlanta and Berkeley) before this one. My wife’s words: Sara is outstanding. She knows so much about the body, is skilled at therapeutic yoga, and has no trouble dealing with a variety of issues while simultaneously managing a class full of students when necessary. IYIP and Sara have helped me through some major health issues in addition to teaching me much about strength, movement, breathing, and more.” -Anind D.
“I am a physician who specializes in musculoskeletal, sports, and spine injuries, and have seen patients sustain injuries while practicing “yoga.” Most of the yoga studios teach more Americanized yoga, while at IYIP, the emphasis is on Iyengar Yoga. I have been taking private lessons with Sara Azarius (founder and owner) and she is amazing. She is one of the few Iyengar Yoga instructors who practice therapeutic yoga. She is also the most experienced Iyengar yoga instructor in Pittsburgh and has trained the other Iyengar instructors. The studio offers group classes, private sessions, and therapeutic group classes (for those with medical or musculoskeletal injuries). She has been invaluable to me and to my patients. I find Iyengar yoga to be extremely beneficial to those with musculoskeletal injuries. I will continue to study with Sara so that I can optimize the health of myself and my patients.” -Samantha K.